With a Taste of Nottingham only days away, let’s look at the myriad of offerings that will be available from some of the city’s best restaurants. The event takes place from Monday 21st to Sunday 27th September 2015. For food lovers this is an exciting time, as it will see a range of food outlets offering tasty treats, a Taste Trail that will see some businesses offering dishes and product samples for just £1, special £10 menus and special events held at some of the many restaurants that are taking part in the event throughout the week. From bars to BBQ, cafes and restaurants, the city has something for everyone and what better time to dine out than during Taste of Nottingham. Visit old favourites such Le Bistrot Pierre, Yamas, and World Service, or try some of the newer eateries on offer in Nottingham such as Reds True BBQ, Rubs Smokehouse, Oaks and Baresca. Wherever you dine I am sure that you will thoroughly enjoy sampling some of the many great food and drink venues that Nottingham has to offer. Many businesses are also offering special £10 menus to make year experience affordable as well as enjoyable. This great offer is available on a wide range of cuisines and can range from two course meals and a drink to coffee and cake for two. The restaurants offering this deal are; Cape, Patisserie Valerie, Red Hot World Buffet, Rum House, Suede, The Stage, Wildwood and World Service. However, many of the places offering these special menus require prior booking or are very popular, so it is worth checking with them in advance to ensure that you don’t miss out. So now on to a bit of information on some of the venues that are taking part in Taste of Nottingham. What can you expect from some of the various restaurants? This quick and easy guide will hopefully give you a ‘taste’ of what will be on offer during the event. But before we start, how about a drink, The Bear and Lace on Maid Marian Way, is a great venue offering a range of beers and their own extensive range of cocktails. Or how about a bitter called Round Heart, which has a malty aroma and a note of chocolate which can be consumed at the Hand and Heart on Derby Road. The Bell Inn on Angel Row serve the popular Bell Inn Bitter, that has become so popular that they even created a chutney containing it too. 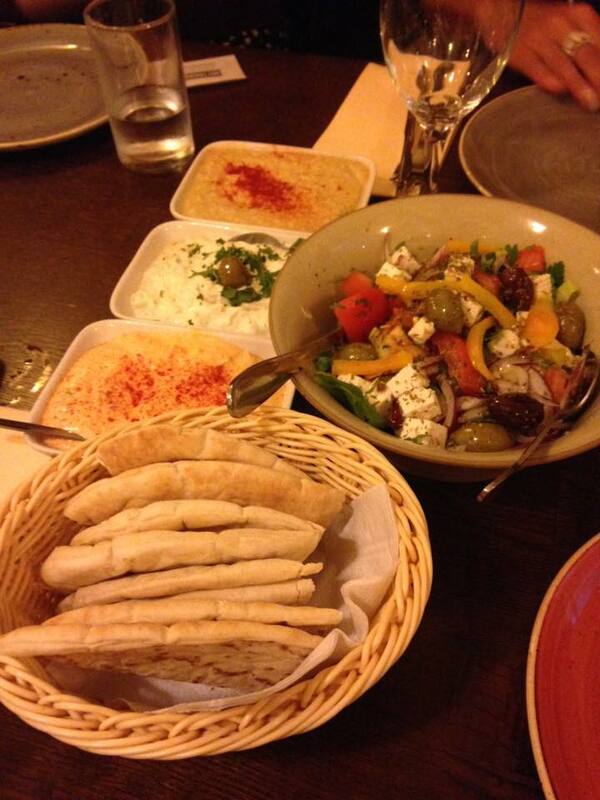 Yamas serve up superb Greek cuisine and it has been spot on every time that I have visited in the past. With vibrant and flavoursome salads to fresh and refreshing traditional tzatziki and hummus dips, your taste buds won’t be disappointed. They also offer a range of souvlaki such as chicken, pork and lamb, which are all juicy and tender as well as being traditionally seasoned and finished with the citrus of a lemon. Yamas are offering a choice of three tapas dishes from a selected menu for just £6.95 from 12pm to 4pm from Wednesday to Saturday. This is probably one of the best value offers you will ever see. The dishes are a good size for tapas and the choice is pretty good too. Most importantly is the quality of the food, fresh and tasteful food in a modern Greek restaurant. You can find Yamas at 5 Thurland Street, Nottingham, NG1 3DR. Only a few minutes’ walk from the Victoria Centre. Oaks is another new venue that are serving up a fine range of foodie delights. 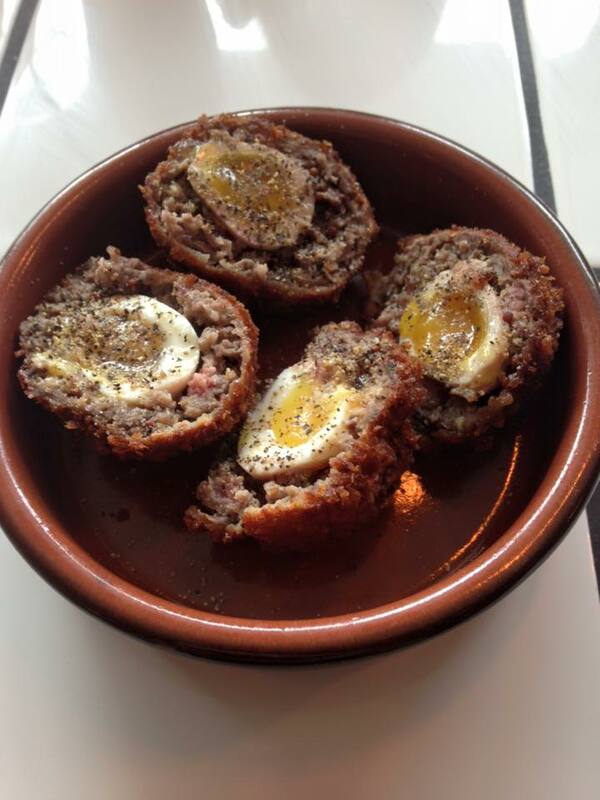 Their scotch quail eggs are a great place to start with a crisp and meaty casing, slightly chewy, with a full body to them and yet still moist on the inside. This is finished off perfectly by the centre of quail’s egg with a runny, golden yolk that has a really rich and silky texture. Also do not forget to order their pork scratching and this recommendation is coming from someone who usually avoids them but their scratchings are light and crisp with an added twist of a slight hit of heat from the chilli powder. They take the time and effort to boil then dry them and then re-cook them, gives them a fantastic texture that isn’t too greasy. They also have a fantastic range of beers and cocktails that you can wash the scratchings down with. Their choice of sausages is varied which means that there is something for everyone and the best part about this is that they are unique so it won’t be a case of the usual boring flavours that you may be used to. The pork and pancetta works really well together and the paprika brings out the smoky and salty flavours. Rubs Smokehouse and bar is located on Adam’s Walk, Fletcher Gate, Nottingham, displays a range of BBQ delights from traditional low and slow classics such as pulled pork and brisket to burgers and epic feasts such as Hung Drawn and Quartered which is a platter of meaty treats ideal for sharing that includes; buffalo wings, a rack of ribs, pulled pork, brisket, a whole chicken, corn dogs, 4 sliders and 8 sides for £68, ideal for 4 people to share. However, you might want to share with more friends as you will regret it if you don’t leave room for dessert at this place. I’d recommend the Nutella, brownie, waffle and banana calzone. 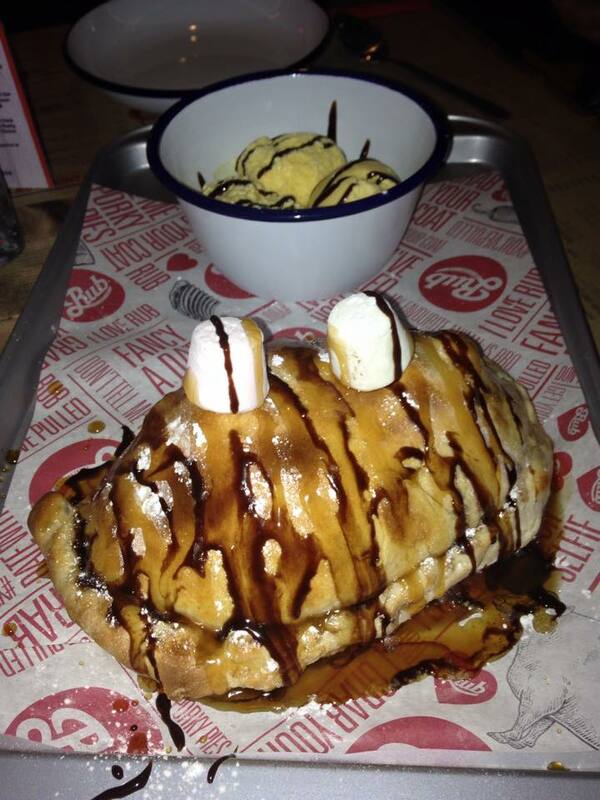 A sweet calzone packed full of the above, served with ice cream, marshmallows and then drizzled with chocolate, toffee and black forest sauce at £9.95, you might need to share! Baresca is the newest addition to Nottingham’s varied and vibrant tapas scene, so unless you eat out regularly or love tapas this may be a new one for you to try. 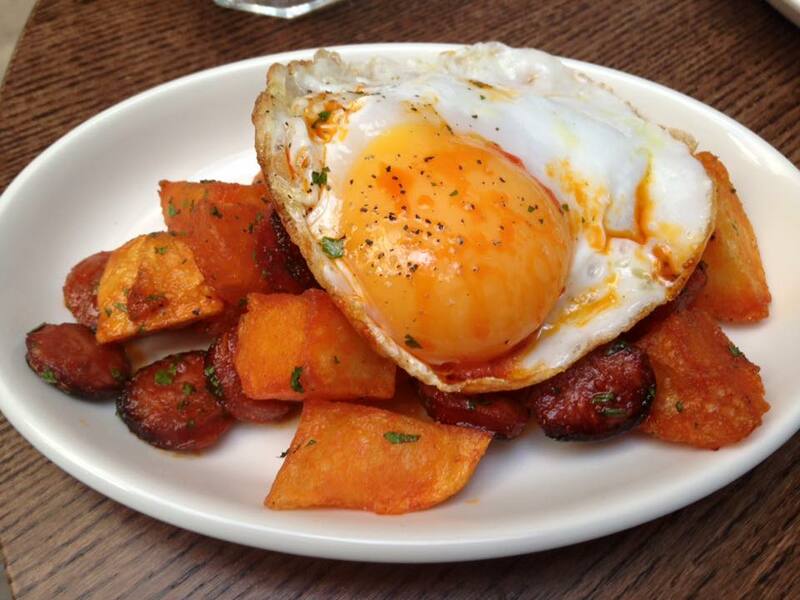 With unique Spanish inspired dishes why not try the chorizo, patatas topped with a fried egg, this Spanish influenced take on an English breakfast is outstanding, rich chorizo with patatas that soak up the juices from the chorizo and fried egg work well together and combines really well as a tapas dish. Even better is the fact that they offer a flatbread that is served with tasty and fresh dips, any two tapas dishes and one side from their selected menu plus a coffee and a sweet treat for just £9.95! The Menu Del Dia offer is available from 12pm to 6:45pm Monday to Friday and 12pm to 5pm on Saturday. Baresca can be found at 9 Byard Lane, Nottingham, NG1 2GJ. The restaurant is in an ideal location just off of Fletcher Gate. Don’t worry if you’re not in the mood for a meal out as there are plenty of other options that will allow you to sample some of the city’s tastiest treats. 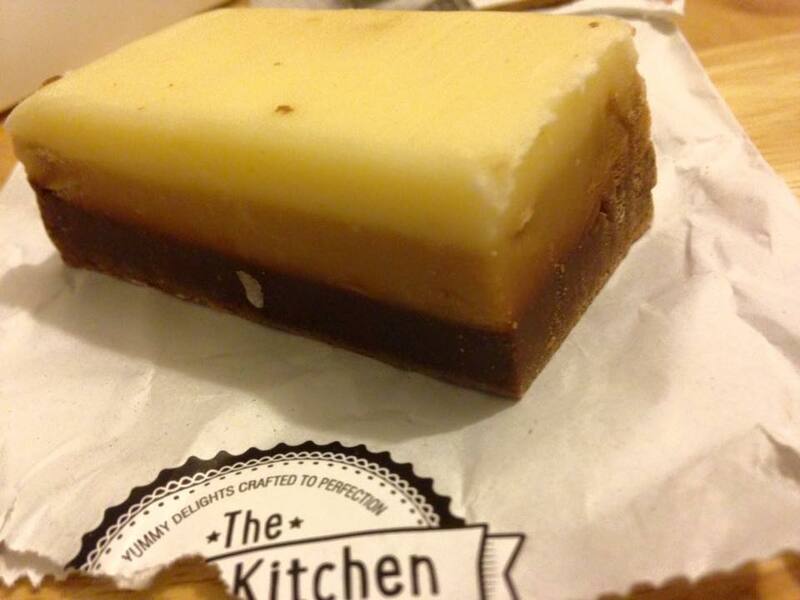 The Treat Kitchen is running a buy 3 get the 4th one free offer on all their 100g slabs of fudge. With flavours such as salted caramel, vanilla honeycomb, raspberry white chocolate and chocolate mint swirl you certainly won’t be short of choice and you might even have to make it buy 6 get 2 free! You can find this sweetie paradise on Wheeler Gate, just off the Old Market Square. The Ugly Bread Bakery is also running some fantastic offers. 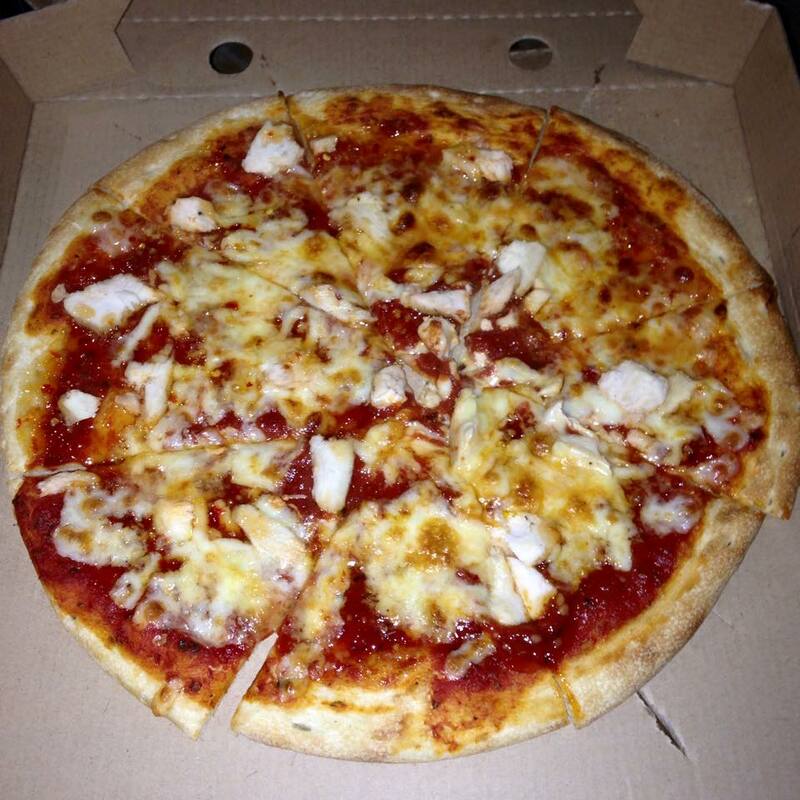 Get any 9 inch pizza for £3 or any 12 inch pizza for £4.50 when you visit their shop between 3pm and 6:30pm. With a fresh and crisp base and some fantastic topping combinations you certainly don’t want to miss out on this offer. Some of the pizzas on offer include; chicken and sweet chilli or even the Nutella based sweet pizza topped with bananas. The Ugly Bread Bakery can be found in Hockley at 39 Pelham Street, Nottingham, NG1 2EA. Aubrey’s Traditonal Creperie, located in the West end Arcade it is a true Nottingham gem and serves a range of sweet and savoury crepes that are expertly made and full of flavour and colour. Some of their most popular creations include; the frazzled chorizo galette which is chorizo served with a cracked egg, caramelised onions and baby spinach for £7.95. La Campagnarde, mushrooms, tomato, ham and emmental for £5.95. 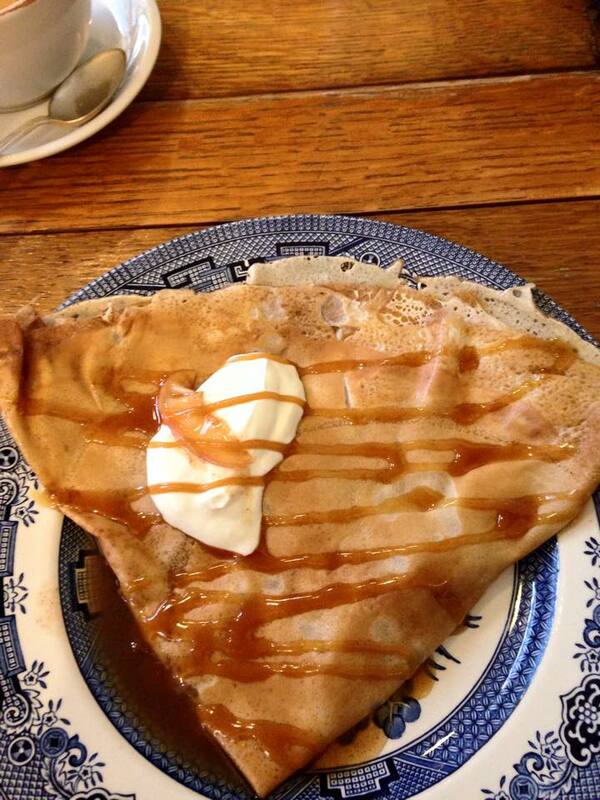 Or how about a sweet crepe such as caramelised apples, apples cooked in butter, cinnamon and sugar, served with crème fraiche and honey for £4.75. Aubrey’s is open from 10am to 6pm Wednesday to Saturday. Some of the many other venues to think about visiting during Taste of Nottingham are; 4550 Miles From Delhi, Calcutta Club, Chutney Village, MemSaab, Kayal, Singh’s and Curry lounge, who all offer a fantastic range of curries with a flavourful range of backgrounds from various cuisines. If you fancy meat, meat, meat, then try some of these; Red’s True BBQ who offer an outstanding range of meats that are packed full of flavour from their low and slow cooking method. 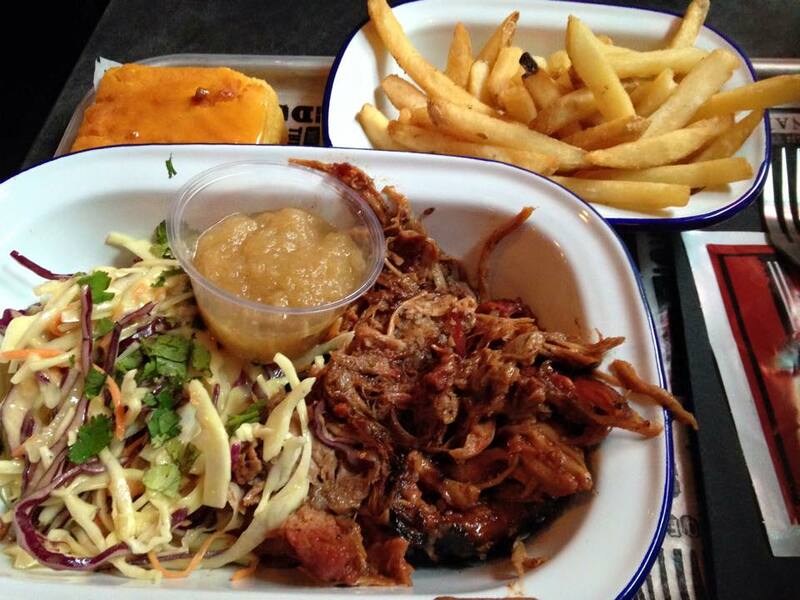 Jim’s Smokehouse who also offer a range of low and slow dishes, look out for their ‘Road House’ burger. The Soulville Steakhouse who offer an wide range of steaks along with a selection of other items such as Cajun chicken and sausages and mash. Five Guys who make burgers fresh ‘your way’. For breakfast or lunch how about trying; The Malt Cross, Cafe Sobar or Wired Cafe Bar who all offer some high quality and tasty variations on breakfast. Or perhaps you want a veggie feast, then try Annie’s Burger Shack, who offer all their burgers as veggie or vegan or Perhaps Alley Café who serve a wide range of vegetarian dishes. From Thursday 24th until the event ends on Sunday 27th September you will also be able to visit The Great Notts Show in the Old Market Square that will bring you the Taste of Nottingham Market. This will bring together some of the city’s best food and drink businesses, conveniently, in once place. During the market you will be dazzled by recipe demonstrations, cook offs. The market will be open from 10am to 6pm Thursday to Saturday and 10am to 4pm on Sunday. There will also be some places offering a Taste Trail. Stalls in the market and businesses in the city that show this poster will have a dish or product that you can sample for just £1! And last but certainly not least there will be a range of exclusive events held at some of the businesses taking part in Taste of Nottingham throughout the week. These include; Craft beer and sausage tasting at Oaks on Monday 21st September, 6pm to 7:30pm and cost £15. This event will allow diners to try all five of their handmade sausages that are made with local ingredients and have been carefully paired with some of their craft ales. To book tickets email info@oaksnottingham.co.uk. Homemade have a secret supper club on Thursday 24th September that runs from 7:30pm to 10:30pm and costs £25. This will give you an evening full of delicious feasting with other foodies. The club will be filled with foods containing Latin flavour, with a welcome drink on arrival. To book call 0115 9243030 or email info@homemadecafe.com with your contact number. Althernatively you could go to a Burrito making class on this evening instead at Barburrito from 7pm for £10. This will give you an exclusive insight into how Barburrito prepare and make their burrito’s and allow you to try every single ingredient and even learn the methods behind wrapping to create a perfect burrito. This includes a burrito and a Mexican beer. To book email Nottingham@barburrito.co.uk. Join in with Genting Casino with are taking part in the Macmillan world’s biggest coffee morning on Friday 25th September, 8am to 11am, where you will be able to try some lovely coffee and cake. Finally, you can attend a sushi master class at Chino Latino on Saturday 26th September, 2pm to 3:30pm for £20. This will allow you to learn the art of sushi making as well as the range of ingredients that can be used when making sushi. This includes a complimentary drink on arrival. To book tickets email nottingham@chinolatino.com. Enjoy the event, eat out loads and share your experiences on social media using the hash tags #TasteOfNotts #Nottingham #JeremysFoodTour If you want any further information visit: http://www.itsinnottingham.com/taste.